Charles County Public Schools (CCPS) held a unique recognition ceremony on Jan. 22 to honor its nominees for the 2019 Washington Post Teacher of the Year and Charles County Teacher of the Year award programs. This is the first year in which a teacher was nominated from each Charles County public school and center. From among the nominees, CCPS chose five finalists to be eligible for either the Washington Post or Charles County Teacher of the Year designation. The Washington Post finalist from CCPS represents the school system in the overall awards program in which one teacher from the Washington, D.C., metropolitan area is named the Washington Post Teacher of the Year. The Charles County Teacher of the Year represents CCPS in the Maryland State Department of Education (MSDE) Maryland Teacher of the Year program in which one teacher receives the overall state honor. The five finalists for both programs are, from left, Melinda Wright, second-grade teacher, Mt. Hope/Nanjemoy Elementary School; Brooke Shnipes, English teacher, La Plata High School; Erin Amore, first-grade teacher, Dr. James Craik Elementary School; Steven Baldo, special education teacher, William B. Wade Elementary School; and John Lush, English teacher, Henry E. Lackey High School. LA PLATA, Md. 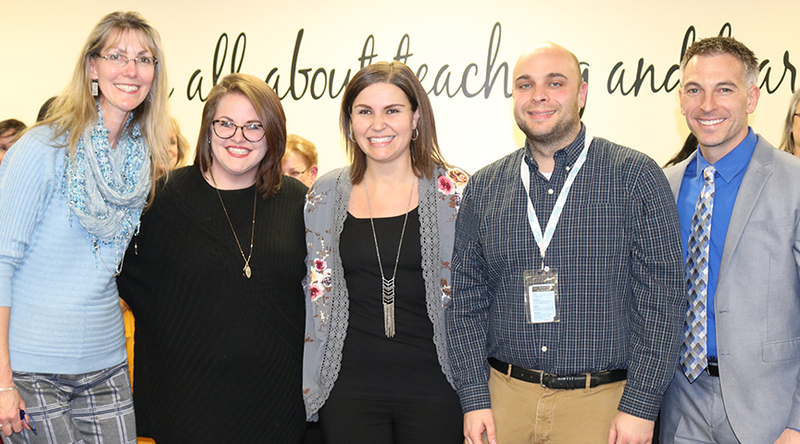 (January 24, 2019)—Charles County Public Schools (CCPS) held a unique recognition ceremony on Tuesday, Jan. 22 to honor a group of special teachers. Honored during the ceremony were nominees for the 2019 Washington Post Teacher of the Year and Charles County Teacher of the Year award programs. This is the first year in which a teacher was nominated from each Charles County public school and center. From among the nominees, CCPS chose five finalists to be eligible for either the Washington Post or Charles County Teacher of the Year designation. The Washington Post finalist from CCPS represents the school system in the overall awards program in which one teacher from the Washington, D.C., metropolitan area is named the Washington Post Teacher of the Year. The Charles County Teacher of the Year represents CCPS in the Maryland State Department of Education (MSDE) Maryland Teacher of the Year program in which one teacher receives the overall state honor. • Melinda Wright, second-grade teacher, Mt. Hope/Nanjemoy Elementary School. From among the finalists, CCPS will select its Charles County Teacher of the Year and its representative in the Washington Post Teacher of the Year program. • Erin Amore, first-grade teacher, Dr. James Craik Elementary School. Amore has been teaching with the school system for 12 years. She started her career with CCPS teaching first- and third-grade at Berry Elementary School and joined the Craik teaching team in 2017. Amore is part of several committees at Craik, including sponsoring the new Girls on the Run Club. She helps to write curriculum and has served as team leader. She believes that building relationships with students is the key to success, and is committed to ensuring that every child is supported in their learning. "Mrs. Amore has proven to be an exemplary teacher. She connects with her students to help them feel safe and appreciated, and instills perseverance in all that they do. 'This is my great teacher; I wish more students could have Mrs. Amore.' This opinion from her student is a true testament in how she is truly an exceptional teacher," Michelle Beckwith, Craik principal, said. • Steven Baldo, special education teacher, William B. Wade Elementary School. Baldo has been teaching with CCPS for 13 years. He is known as an all-around educator who takes an instructionally sound approach to teaching. His passion is special education and working with students of all abilities. He builds and maintains a positive rapport with all students at Wade, and presents content in engaging ways. Baldo has high expectations for students and empowers them to be successful to achieve their goals. He is the head coach of the school's Unified basketball team and makes it fun for students. Baldo is well known for finding out what engages a student and then building on that to boost their self-esteem. "Mr. Baldo finds the uniqueness of each of his students by paying attention to what engages them. He will always build a student from the standpoint of what she or he can do best," Kevin Jackson, Wade principal, said. • John Lush, English/AVID program teacher, Henry E. Lackey High School. Lush has been teaching at Lackey for 14 years and is an integral part of the school community. He teaches English I, II and III and Advancement Via Individual Determination (AVID) classes. Lush also is the program coordinator. His belief that students learn by constructing meaning from the world around them shapes his philosophy and instruction in the classroom. Lush serves as a role model for students and goes out of his way to ensure each of his students is successful and prepared for life after graduation. Lush also served as a football coach for several years and strives to help each student be successful. "The quality that defines Mr. Lush is his "passion" for his students, players, the school and the community as a whole. His students know that there is not anything he would not do for them, and, as a result, they respond with that same level of effort in the classroom and on the field," Heather Alvarez, high school resource teacher at Lackey, said. • Brooke Shnipes, English teacher, La Plata High School. Shnipes has taught for CCPS for nine years, all of which she has spent at La Plata. She teaches Advanced Placement (AP) Literature and Composition, AP Language and Composition, and English III. Shnipes also teaches English III during the evening high school program and summer school. Shnipes fosters in students a desire to be lifelong readers, writers and learners. She sponsors the National English Honor Society, the school newspaper, The Gauntlet, and the Write Group creative writing club. Shnipes is the English department chairperson and volunteers as a member of the Positive Behavioral Intervention and Supports (PBIS) team. She also helps to coach cheerleading, serves as a class sponsor and mentors new teachers. "Ms. Shnipes is highly regarded as an outstanding teacher by her colleagues around Charles County. 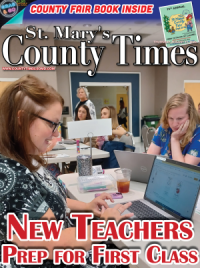 She often presents at countywide professional developments and is a 'go-to' for teachers who want to discuss new strategies and ideas," Douglass Dolan, La Plata principal, said. • Melinda Wright, second-grade teacher, Mt. Hope/Nanjemoy Elementary School. Wright is a veteran CCPS teacher with 26 years of experience teaching at the elementaryschool level. Wright is a master teacher and a model instructor for Project Lead the Way, formative assessment and the implementation of science, technology, engineering, art and math (STEAM) education. She is an expert at differentiation and team teaching to meet the needs of all learners. Wright has served as a team leader, mentor teacher for student teachers, and as a coach and leader of afterschool teaching and enrichment programs. She has used her instructional expertise to write social studies, math and reading curriculum. Mt. Hope/Nanjemoy Principal William Miller said Wright is the definition of an exemplary teacher. "Mrs. Wright is Nationally Board certified and a consummate professional; she is the first teacher in the building every morning and one of the last to leave in the evening. She takes great pride in everything she does. When looking at the big picture of the success of Mt. Hope/Nanjemoy Elementary, Mrs. Wright has a hand in all of it," Miller said. The nominees honored Tuesday include the following teachers. • Paula Schiller, Infants and Toddlers Program teacher, F.B. Gwynn Educational Center. Schiller is a special education teacher in the Infants and Toddlers Program at the Gwynn Center and serves as team leader. She has worked at the Gwynn Center since 2002 and is a strong advocate for students with special needs. Schiller provides students and their families with strategies for success at school and home. She is a state certified trainer in Routines Based Interview (RBI) and is Charles County's representative for Evidence-Based Practices with MSDE. Schiller helps to organize community events such as Kid Fit, art, and music with the Department of Community Services. "Paula seeks opportunities to enhance the program and help her team implement best practices for children and families. She helped organize a six-month professional development for Infants and Toddlers staff on evidence-based practices in early intervention. Paula is committed to making a difference in every aspect of her life," Daphne Burns, Gwynn Center principal, said. • Dawn Turner, kindergarten teacher at C. Paul Barnhart Elementary School. Turner has been teaching with CCPS for 17 years and was nominated by Barnhart Principal Brian King. Turner taught first grade for five years and then moved to kindergarten. Before earning her certification, Turner worked as a special education instructional assistant for CCPS. Turner said it was during her time as a volunteer at her children's school that she realized education was a career she wanted to pursue. "I teach so that I can level the playing field for the young children in my class. Most of my students come from families that do not have the resources that were available to me and to my children. I strive to provide my students with opportunities to be successful in a joyful, loving, learning environment," Turner said. • Samantha DeNardo, English as a Second Language (ESOL) Teacher, Berry Elementary School. DeNardo has been teaching with CCPS for the past seven years and works with students in prekindergarten through Grade 5. She was nominated by her principal, Louis D'Ambrosio, and several of her Berry colleagues. DeNardo has immersed herself in the ESOL community, from helping to write curriculum and facilitating camps to setting up annual ESOL nights. She takes pride in advocating for students and their families. DeNardo said what she most enjoys about her job is being able to build relationships with students. "Sometimes I am their voice when they aren't able to communicate and other times, I am the person who helps to make learning a little easier. Being the person who advocates for each of them is something I take a lot of pride in and will always continue to do," DeNardo said. • Monique Richardson, third-grade teacher, Dr. Gustavus Brown Elementary School. Richardson has been teaching with CCPS for eight years and previously taught with Prince George's County Public Schools. Richardson is certified in early childhood/general education and special education. She is teaching an inclusion class and has worked with students in kindergarten through Grade 4. Richardson's strong background in special education makes her a go-to for her colleagues in need of strategies to meet the needs of all levels of learners. She focuses on relationship building and works hard to reach students. "Within the years of teaching a self-contained class, Mrs. Richardson took the time to instill the confidence in each child so much so that they, as a class, performed a dance in front of the whole school during a talent show. Mrs. Richardson was able to lead an entire school to support one another in that very moment," Kristi Tewell, an instructional assistant at Brown, said. • April Moore, first-grade teacher, William A. Diggs Elementary School. Moore has been teaching with CCPS for 15 years. She began her career in 2004 at J.C. Parks Elementary School and moved to Diggs when the school opened in 2006. She is a kind and compassionate teacher who takes the time to get to know each of her students. Moore has served as team leader, helped with the school's Growing Green Club, assisted with parent events and mentored inclusion teachers. She also coordinates the schoolwide Veterans Day assembly and oversees planning and field trips for the first-grade team. She is known among her colleagues as a teacher who strives to ensure students have fun and enjoy learning. "Ms. Moore's greatest love is teaching her children. Ms. Moore possesses the qualities of an outstanding educator. First and foremost is her ability to instill a desire for her students to learn and achieve. Her positive and welcoming tone establishes an immediate bond with her first graders, and she takes the time to get to know each of their unique personalities," Debra Calvert, Diggs principal, said. • Pamela Brannon, second-grade teacher, Gale-Bailey Elementary School. Brannon has been teaching for 30 years and spent 25 years with CCPS. She started her career with Prince George's County Public Schools and joined the teaching team at Gale-Bailey in 1994. Brannon has taught first-, second- and fifth-grade students and decided she wanted to be an educator when she herself was in first grade. It was Brannon's first-grade teacher, Ms. Phillips, who instilled in her a love for learning. Each day in her classroom, Brannon strives to create a caring and inviting environment for students. She is friendly, helpful and kind. "She understands the importance of being a team player; building relationships with students and their families. She mentors students daily to help them build their selfesteem. She does what she can to make a difference in the life of every child that crosses her path," Timothy Rosin, vice principal at Gale-Bailey, said. • Tricia Harrington, special education teacher, Dr. Thomas L. Higdon Elementary School. Harrington has worked for CCPS for 14 years and began her career at Parks. She moved to Higdon in 2015, where is the special education department team leader. Harrington spent several years as a primary-level special education teacher, working with students in kindergarten through Grade 2. She now works with students at all elementary levels, based on student need. Harrington collaborates, supports and motivates staff, students and parents to ensure proper support and instruction is available. She is a master of co-teaching and works with staff to differentiate for the wide variety of learners. Harrington is known among her colleagues as a valuable resource for special education. "In addition to her highly effective evaluations, the relationships she builds as well as her leadership ability drive the instructional support program at Dr. Higdon. She has worked as a team leader for the past six years, providing consultation to the principal and supporting her team to utilize data to make instructional decisions which has helped to close the achievement gap in reading for special education students," Kathleen Morgan, Higdon principal, said. • Nancy Ahern, kindergarten teacher, Indian Head Elementary School. Ahern is a veteran teacher with CCPS; she has spent the past 28 years at Indian Head. Ahern has taught kindergarten and first grade and is a valuable asset to the school community. She herself attended Indian Head, General Smallwood Middle School and graduated from Lackey. Ahern said she knew at age 9 that she wanted to be a teacher. Her father taught for Prince George's County Public Schools and Ahern would often visit his classroom on her days off from school. She strives to instill in her students a desire to learn and achieve. Her students leave kindergarten ready for first grade. She is a master teacher and often observed by other teachers in Charles County. "She is teaching the children of the children she taught in her early years. Her father would often say that he knew teachers that taught for 30 years on one year's experience. She took that to heart. She has tried to improve as a teacher every year," Shane Blandford, Indian Head principal, said. • Elaine Coombs, special education teacher, Daniel of St. Thomas Jenifer Elementary School. Coombs has worked for CCPS for the past 29 years. Her classroom experience includes teaching students with various special needs in prekindergarten through Grade 3. Coombs has also served as team leader. She collaborates daily with her students' regular education teachers and incorporates best practices to benefit her students. Coombs provides individual behavior plans and models positive behavior for her students. She treats each child as an individual and is conscientious about helping each child meet his or her academic goals. "Even though she works with some of our most academically and behaviorally challenging students, she always treats her students with dignity and respect. Mrs. Coombs goes above and beyond the role of the classroom teacher. She is often involved in organizing and participating in school events that promote student and parent growth and knowledge," Nancy Seifert, Jenifer principal, said. • Linda Hollomon, fifth-grade teacher, Malcolm Elementary School. Hollomon is a longtime CCPS teacher with more than 40 years of experience as an educator. She began her career with CCPS in 1984 at Malcolm and previously taught in Virginia and Prince George's County. She believes every child can succeed and presents clear expectations for students. Hollomon creates a learning environment in which students leave with a positive feeling of self-worth. She works with students to create weekly goals and proudly displays their work in the classroom. Her colleagues know her as a teacher who uses knowledge of a student's strength to release their desire to excel. "Her true leadership qualities are best seen in the classroom. She is dedicated to opening the eyes of children to education, whose home, emotional and sometimes economic difficulties seem insurmountable. With the ability to understand the child's predicament, she will gain the respect and promise to succeed from children. Slowly, a work ethic evolves, in addition to acquiring self-respect. No child will get by or around her—everyone succeeds," Mary Finneran, Malcolm principal, said. • Nina Capuano, third-grade teacher, T.C. Martin Elementary School. Capuano has been teaching with CCPS since 2006 and started her career at Arthur Middleton Elementary School. She moved to Martin in 2015. She served as team leader at Middleton and currently holds the position at Martin. Capuano is from New York and said she moved to Charles County after she was recruited by former J.P. Ryon Elementary School principal, and now Board of Education Chairman, Virginia McGraw. Capuano teaches the third-grade inclusion class, which includes students who have academic challenges and other nurturing needs. She demonstrates a high degree of patience with children and displays a focus on learning and achievement. Capuano is known as a kind, inclusive and compassionate teacher. "By creating a nurturing and warm classroom atmosphere coupled with a patient and well planned approach, Mrs. Capuano instills in students a desire to learn and achieve at their highest potential," Robert Opiekun, Martin principal, said. • Tracy Bell, third-grade teacher, Mary H. Matula Elementary School. Bell has been teaching with CCPS for 12 years and previously taught with Prince George's County Public Schools. She strives to create a supportive and nurturing learning environment for students. Bell ensures her students are comfortable in their learning and confident in their abilities. Her rapport with students promotes positivity and patience. Bell strives to maintain relationships with each of her students so she can help them grow into confident learners. "Building relationships is very important to me. I want my students to be successful, but most importantly I desire for them to feel valued. Connecting with my students is the first step for me to instill a desire to learn and achieve. The only way this happens is for me to get to know them," Bell said. • Theresa Gough, special education teacher, Arthur Middleton Elementary School. Gough has been teaching at Middleton for six years and oversees the SOAR program at the school. SOAR stands for Structured teaching, Opportunities for social inclusion, Active learning and Rigor. It is a regionalized program for students with autism who require specialized instruction. Prior to earning her teacher certification, Gough worked as an instructional assistant for six years. Teaching is a second career for Gough, who wanted to make a bigger impact with children. She puts her students first and volunteers to help wherever she can assist. The passion she has for teaching is evident in her kind and caring demeanor. "Mrs. Gough is the embodiment of positivity, inclusiveness and hard work. To her students and their families Mrs. Gough is more than a teacher, but a 'light in [their] autism world.' She finds the time to not just teach her students but support them and their families," Benjamin Harrington, Middleton principal, said. • Kimberly Williams, kindergarten teacher, Walter J. Mitchell Elementary School. Williams has been teaching with CCPS for eight years. She instills in her students a desire to grow and achieve. She is kind, caring and strives to create positive relationships with all of her students. Williams recently taught a student who needed to attend school remotely through use of an iPad and robot. Mrs. Williams' understanding of his needs allowed him to maintain full participation in class, including the ability to "turn and talk" to friends in his reading group. She shares "Williams Waffle Wednesday" with her teammates and is a leader on the Acts of Random Kindness committee. Williams also serves as the team leader, presents at schoolwide and county professional development sessions, and helps to support several after-school activities at Mitchell. Sabrina Robinson-Taylor, Williams' former principal, said Williams is the true definition of a passionate teacher. "Mrs. Williams is strong and forms positive cooperative relationships amongst fellow colleagues. She promotes team building and self-care with colleagues and is a huge advocate in promoting kindness and positivity daily," Robinson-Taylor said. • Genevieve Gorman, first-grade teacher, Dr. Samuel A. Mudd Elementary School. Gorman has taught for CCPS for eight years. In addition to first grade, Gorman has also taught prekindergarten and kindergarten. She focuses on taking individual students' uniqueness to help them develop their talents. She is the inclusion class teacher and helps her students flourish both academically and behaviorally. Gorman is kind, caring and committed to her students. She models compassion through her actions, and as a result, her students are more open to understanding the world around them. Mudd Principal Orlena Whatley said Gorman is a role model. "Ms. Gorman has empathy. Empathy is an important trait to have and to try to develop in our students and ourselves. Being able to put yourself in someone's shoes and see things from their perspective can have such a powerful impact on our decisions and actions. Ms. Gorman always puts herself in her students' shoes. She wants to make sure that she models her expectations so that her students can see and believe in themselves just as she believes in them," Whatley said. • Danielle Nagle, fourth-grade teacher, Mary B. Neal Elementary School. Nagle has taught for CCPS for the past nine years, all of which have been at Neal. Nagle is also a graduate of La Plata High School. She comes from a family of educators and decided in elementary school that she wanted to be a teacher. She is organized and well planned; she is always prepared for the school day. This helps Nagle to maximize instructional time and helps students reach their full potential. Nagle maintains a nurturing learning environment where children feel safe, cared for and capable. Nagle is known among her colleagues as a team player and her commitment to Neal is present in all that she does. "Teaching is more an art than a science. Danielle has all of the skills needed to be a good instructor and she delivers engaging and challenging instruction. The quality that makes her a master and inspired teacher, however, is her heart," Deborah Brown, Neal principal, said. • Stephanie Hill, third-grade teacher, J.C. Parks Elementary School. Hill is a veteran CCPS teacher with 27 years of experience in the classroom. She started her career at Craik in 1991 and joined the Parks teaching team in 2000. Hill has worked with students in all grade levels at Parks and is certified in special and elementary education. She has served as a team leader, PBIS committee member and presents at professional development sessions. The environment in her classroom is kind, nurturing and structured. Hill said her goal is to provide her students with a learning environment in which they can flourish. "It is my intention to not only teach children to be remarkable and confident readers, writers and mathematicians but to also be productive members of society now and in the future. I provide a classroom environment that is warm, nurturing and structured. These elements encourage an atmosphere in which every child can thrive and grow educationally, socially, behaviorally in order to meet their full potential," Hill said. • Michelle Colbert, three-year-old program teacher, J.P. Ryon Elementary School. Colbert has led the three-year-old program at Ryon for the past 12 years. Prior to joining CCPS, Colbert owned a private childcare and taught with Prince George's County Public Schools. She is the grade-level team leader, writes curriculum and serves as a mentor for other three-year-old program teachers. Colbert is kind, caring and passionate about working in early childhood education. She values connections she makes with her students. "I view teaching as a gift where I have the ability to help change and motivate all learners. The key to making this difference is building a relationship with the student and community making them both empowered and instilling in them that they can achieve all goals. The student then has a belief in themselves, a support system that believes in them and a sense that all things are possible," Colbert said. • Christine Turner, language arts teacher, Theodore G. Davis Middle School. Turner has been teaching for 19 years and has spent the past 11 years teaching at Davis. 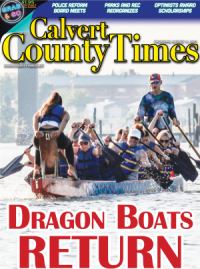 She previously taught language arts with Calvert County Public Schools. Turner is a master teacher who is committed to ensuring her students achieve success. Not only does she work to meet the individual needs of students, Turner uses small group instruction to improve students' reading and achievement skills. She is a leader among her colleagues and oversees the AVID program, serves as the eighth-grade team leader and is the Spelling Bee coach. "Turner is an extraordinary teacher here at Davis. Her teaching abilities have been an asset to our school. She maintains positive relationships with students, parents and staff and is an essential part of our school community," Kim McClarin, Davis principal, said. • Shay Crisp, language arts teacher, John Hanson Middle School. Crisp has been a teacher for nine years, five of which have been with CCPS. Prior to joining the teaching team at Hanson, Crisp taught in Florida. Crisp teaches sixth-grade language arts and also is certified in special education. Before she began teaching, Crisp spent 15 years a child and adolescent counselor, and behavior specialist. She understands the needs of her students and possesses the ability to balance effective case management with strong instructional practices. Students benefit from her interactive lessons that provide relevant topics for students to read about and debate. Crisp consistently provides a variety of strategies and techniques to ensure students are challenged, engaged and supported. "She is a leader in the building and takes full responsibility of the sixth-grade team. New staff members benefit from her positive encouragement and wealth of knowledge when handling situations. Her communication with parents is commendable as she reaches out to all of her families regularly with updates," Benjamin Kohlhorst, Hanson principal, said. • Siobhan O'Brien, vocal music teacher, Matthew Henson Middle School. O'Brien has been teaching with CCPS for four years and previously served as a music teacher in New York. She oversees students in sixth-, seventh- and eighth-grade classes and instills in students a desire to learn and achieve. O'Brien sets high expectations for students, fosters their self-esteem and encourages their talents. She oversees more than 75 students in the eighth-grade chorus, and 60 students in the seventh-grade chorus. O'Brien meets with students before and after school, and works with students during the school's activity period called Husky Time. Her choirs have received consistent superior ratings at the CCPS District Assessment Adjudication. "Ms. O'Brien is both a role model and advocate for her students. She provides students with an opportunity to develop their talents while finding success in a supportive, yet challenging environment," Christina Caballero, Henson principal, said. • Kimberly Stackhouse-Isaac, mathematics teacher, Mattawoman Middle School. Stackhouse-Isaac has worked for CCPS for six years and taught a total of 15 years. She began working at Mattawoman in 2013 and teaches eighth-grade Algebra. She is known among her colleagues as someone who makes teaching and learning seem easy and effortless. Stackhouse-Isaac is kind, compassionate and motivating. Her goal is to mold every student in to a high achiever. Stackhouse-Isaac challenges her classes with real-life activities and fosters a positive learning environment. She also serves as sponsor of the National Junior Honor Society, Student Government Association and is an AVID tutor. "You can always count on Mrs. Stackhouse-Isaac to greet you with a smile and some type of motivating word for the day. She demonstrates a thorough knowledge of the subject matter and the ability to share it effectively with her students," Sonia Blue, Mattawoman principal, said. • Caitlin Timko, mathematics teacher, Piccowaxen Middle School. Timko has been teaching with CCPS for 12 years, all of which she has spent at Piccowaxen. She teaches sixth-grade math and strives to ensure her students achieve success. Each year, she requests to work with students who are either on- or below-grade level in math. She enjoys working with students who may have difficulty learning about math and helping them become confident. Timko's students often achieve high scores on county assessments. Her lesson plans are tailored to meet the students where they are to ensure greater success for all students. "A walk through Mrs. Timko's classroom is a joy. Students who tend to present challenging behaviors in other classrooms can be observed in her class working collaboratively with other students and offering their educated guesses with their classmates," Wendell Martin, Piccowaxen principal, said. • Richard Weis, special education teacher, General Smallwood Middle School. Weis has been teaching for 20 years and has spent 16 years with CCPS. He taught at GaleBailey for several years and joined the special education team at Smallwood in 2017. Weis creates a welcoming environment for students, who thrive in his classroom. He goes out of his way to volunteer his time for students who need additional assistance. Weis serves as an AVID program mentor and collaborates with his colleagues to help students with missing assignments. He takes pride in the work of his students, which helps to raise their confidence levels. Weis is also the summer program site coordinator, team leader, Spelling Bee coach, and math team, chess club, Vex Robotics and Math Counts sponsor. "He meets with students to discuss grades on a regular basis and helps them feel like they can be successful. He works with students individually to ensure understanding of content materials and offers time during lunches to work on math and any other subject students may need assistance with," Brenda Tillotson, Smallwood principal, said. • Natalie Gilliom, mathematics teacher, Milton M. Somers Middle School. Gilliom has been teaching for 13 years, seven of which have been with CCPS. She joined the teaching staff at Somers in 2014 and also taught at Indian Head Elementary School. She is certified in elementary and special education, as well as middle school math and social studies. Gilliom teaches seventh-grade math and inclusion classes. She caters to the learning styles of each student and ensures all students understand course material. Gilliom has excellent classroom management strategies and encourages her students to try their best. Somers Principal Sandra Taylor said Gilliom's classroom is a positive learning environment. "Her solemn voice, calm classroom and patient spirit allow her to handle all behaviors especially those students exhibiting more intense behaviors. She is able to get the attention of every single student without raising her voice," Taylor said. • Nathan Mouli, social studies teacher, Maurice J. McDonough High School. Mouli has been teaching with CCPS for 13 years. He is an example of a teacher who truly loves the subject they teach. Mouli teaches local, state and national (LSN) government and is passionate about instruction. He makes the content come alive for students, allowing them to better grasp course material. Mouli ensures his students are engaged and active in their learning. He is the social studies department chair and oversees the student service-learning program at McDonough. Mouli was recently honored by the Board of Education as the 2018 exemplary employee for McDonough. McDonough Principal Steven Roberts said Mouli is kind and committed to each of his students. "Mr. Mouli is an exceptional classroom instructor with thorough knowledge of his subject matter, which he shares with great effectiveness with his students. Mr. Mouli models what it means to #ChooseKind. His deep conviction that every student matters is communicated in a hundred nuanced ways throughout each school week," Roberts said. • Cary Smith, English teacher, North Point High School. Smith has been teaching with CCPS for 16 years and started her career at Mattawoman. Smith taught language arts at Mattawoman and moved to North Point in 2005 when the school opened. She teaches AP Literature and Composition, different levels of English I, II, III and IV (A level and honors), literacy, yearbook and is the English department chair. She is also ESOL certified and holds National Board Certification. Smith goes above and beyond to ensure the success of her students. She plays a vital role in the survival of the AP Literature and Composition, and yearbook programs. "Mrs. Smith has volunteered to be part of many different organizations in her time at the school. She is highly regarded by the staff members at North Point High School and can be described as someone who is honest, inspires others and teaches her students with integrity," Daniel Kaple, North Point principal, said. • Matthew Chisholm, social studies teacher, St. Charles High School. Chisholm has been teaching with CCPS for 10 years. He began his career at Henson in 2009 and moved to St. Charles in 2014. Chisholm is a CCPS graduate and is known among his colleagues as a teacher who excels at building relationships with students. His classroom is inviting and engaging, and his students want to be in his class to learn and grow. He teaches several classes, from World history and U.S. history to AP courses. Chisholm is highly respected by both students and staff. He is the boys' varsity soccer coach and has served as a PBIS coordinator, HITS Expo presenter and team leader. St. Charles Principal Richard Conley said Chisholm is a role model teacher. "He engages students in a way that makes them feel cared for, acknowledged and understood. Matt builds relationships with his students, which drives their desire to learn. He is enthusiastic for his content takes into account the interests of his students," Conley said. • Niyati Green, English teacher, Thomas Stone High School. Green has been teaching with CCPS for four years. She joined the teaching team at Stone in 2014 and teaches English II and AP Literature and Composition. She is the English department co-chairperson, helps to develop schoolwide professional learning opportunities and presents at countywide professional development sessions. Green holds collaborative planning meetings and opens her classroom to mentor English teachers across Charles County. She is the National Honor Society sponsor, and helps students plan and implement various school and community service projects. "Mrs. Green believes that meeting students where they are instead of assuming where they should be creates an atmosphere of trust in her classroom. She works to praise their strengths in every aspect of her work with students in order to encourage them to continue to use those strengths," Gwendolyn Todd, high school resource teacher at Stone, said. • Stephen Warner, social studies teacher, Westlake High School. Warner has been teaching with CCPS for seven years. He started his career as a social studies teacher at Stethem and moved to Westlake in 2015. Warner teaches AP world history and AVID I. He creates engaging lesson plans and has high expectations for students. Warner strives to meet the needs of all learners and is a mentor to both students and staff. He models hard work and determination while offering a nurturing and positive learning environment. Warner exudes a passion for social studies that his students see and it helps to engage them in the learning process. "With his compassion for the students and love of the subject matter, he invites students into a world of social studies that is rigorous and rewarding. Looking around his classroom, the many samples of student work is evidence of their hard work and desire to learn," Philip Jones, vice principal at Westlake, said.